Posted on Tue 27 Sep 2011 at 1:51 PM PST. Filed under Recipes. I have thousands upon thousands of recipes. I’ve bought many books over time about cooking, not because I use them a lot as guides, but for some reason, I… enjoy viewing interesting food pictures. Needless to say that I never buy cookbooks without pictures. Since I turned Paleo/SCD a lot of these books are partly-useless. I don’t have plans to ever going back to grains (even if I wanted to, I can’t), so I’m thinking of donating some of these books to my local library. At the same time, I have started replenishing my cookbook addiction by buying some books about grain-free cooking. My two favorite such books are the brand new “Paleo Comfort Foods“, and the few months old “Primal Blueprint: Quick & Easy Meals“. The following recipe, which is what I had for lunch today, is a loose adaptation of the original recipe “Dirty Cauliflower Rice” found in the “Paleo Comfort Foods” book (page 192). It was truly delicious! 1. Wash the bones. In a deep pot add all the bone broth ingredients, and fill up with water. Cook in medium heat. 2. The bone marrow will start having some “dirty” substance on the surface after a few minutes. Using a tablespoon, remove it and discard it. When there’s not much of that substance anymore coming out, cover and cook for 2-3 hours in low heat. 3. Turn off, and allow the bone marrow soup to cool a bit. Then, using a strainer, separate most of the liquid broth from the other ingredients. Reserve the broth in a big glass container, and put it in the fridge. Enjoy the rest of the ingredients on their own, as your lunch or dinner (add some lemon). 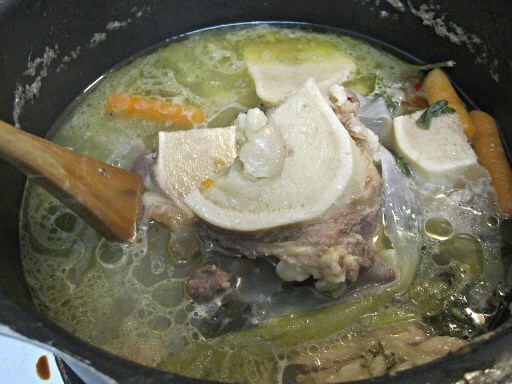 Sep 23 2011: That was when I was officially baptized as a Paleo dieter: my first bone broth! 4. Preheat oven at 410 F (210 C). On a rather tall but small baking dish, add the tomato, jalapeno, and then the beef heart. Pour 1/2 cup of water and some oil on top. Bake for an hour, turning the heart 4 times during that time. 5. When done, let it cool for a bit, and then remove the heart from the dish and set aside to cool even further. Reserve the baking liquid in a separate container. Discard (or eat as a snack) the tomatoes & jalapeno. 6. When cool, cut the heart in small pieces, about 1/2 inch thick. Having the heart frozen for just 10 minutes prior to cutting it, will help you cut it easier. 7. Wash, and then “rice” the cauliflower using the shredder blade in your food processor. If you don’t have such a tool, just use a large kitchen knife and cut it in very small pieces. 8. 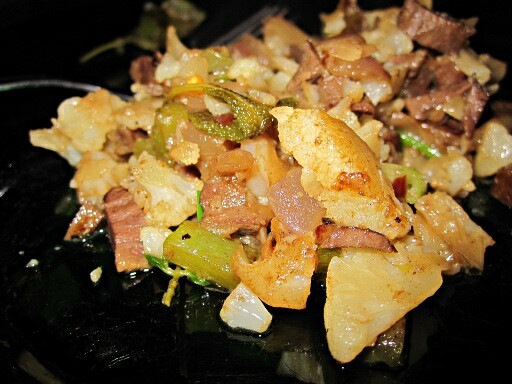 On a deep frying pan or wok add some oil, and the chopped white onion, celery, peppers, and garlic. Fry in high heat until transparent, stir occasionally. 9. Add the cauliflower, and the spices. Stir fry a bit more, until the color starts changing to brown. Add the meat and stir fry a bit more. 10. Add 1/4 cup of the baking broth, 3/4 cup of the bone broth. 1 minute before removing from heat, stir in the chopped spring onions too. Cook in high heat until all liquid is dissolved, and the consistency has changed to something between Chinese fried rice and risotto. Enjoy!